Metalformers enhance the capabilities of their waterjet-cutting machines by adding five-axis and rotary-axis machining, which allow them to increase their part-cutting diversity. 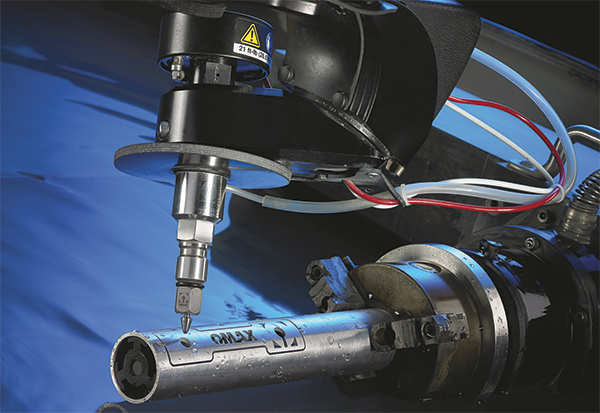 Follow these six basic tips/suggestions for ensuring that your waterjet-cutting machines operate at their full potential and at maximum productivity. The tips encompass operators, machines, maintenance and software. 1) Training—As with most other metal-fabricating operations, waterjet-cutting machine operators play a critical role. A machine is only as productive as its operator, so the better trained he is the more likely he will be to operate the machine at its optimum performance level. Metalformers should invest in extensive and continuous operator training; some machine suppliers offer free training. 2) Preparation—Prior to installing your machine, test the quality of the water. Water quality impacts machine performance—some shops may need to add water filters or chillers. Also, we often recommend that shops locate their waterjet machines close to the water source, and to a drain. 3) Size—Be sure to specify cutting-table size based on the largest part or sheet/plate blank that will be cut on the machine. Consider not only existing jobs but also those being considered for the future. 4) Capability—One common capability metalformers leverage to optimize waterjet-machine performance is monitoring changes in workpiece-material thickness and surface, and automatically adjusting for changes. This avoids the risk of machine damage if an operator momentarily steps a from the machine. Plus, such a function allows for continuous uninterrupted machine operation. Another is the capability of a machine to actively control taper, to adjust for the naturally occurring taper of a waterjet stream. Some suppliers offer machine-control functions to make maintenance proactive rather than reactive. With this monitoring ability, shops can minimize or eliminate unexpected downtime. Other performance-enhancing capabilities include five-axis and rotary-axis machining, which allow shops to increase their part-cutting diversity. Machines gain the ability to process a wider range of part types to further increase their productivity potential. Shops considering acquiring a waterjet-cutting machine should consider the ability to cost-effectively retrofit the machine as they look to add options to further enhance performance and productivity. 5) Maintenance—For optimum performance, waterjet machines must be well maintained and in excellent operating condition. Some suppliers offer machine-control functions to make maintenance proactive rather than reactive. For example, maintenance-management software will monitor machine components for wear and indicate when preventive maintenance is required. 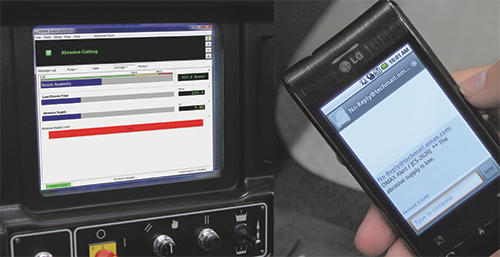 With this monitoring ability, shops can minimize or eliminate unexpected downtime.